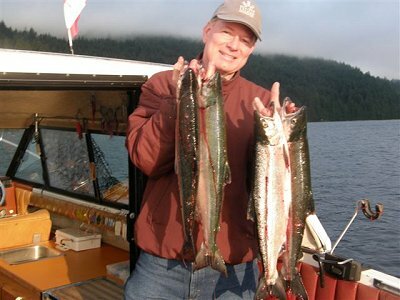 30th July, 2010: FISHING REPORT: Port Alberni Inlet, Barkley Sound, Ucluelet (West Coast), Somas-Stamp River System. The current fishing conditions continue like the weather “HOT”. The Sockeye fishing in the Port Alberni Inlet has been unbelievable and has benefited the Port Alberni economy and tourism activity extensively. The current fishing on outside waters out of Ucluelet and the surf line areas of Barkley Sound have seen record numbers of Chinook salmon migrating to southern watersheds. The fishing on most days has been very good especially for three year old Chinook. The total return of Somass Sockeye to terminal fishing areas in the Port Alberni Inlet has been reforecast to 1.1 million salmon. This is a total of 500,000 Sockeye extended from the original forecast of 600,000. The Adult escapement goal is 449,000 and is currently at 422,000. Great Central Lake has current return through its fish way of 182,000 and Sproat Lake 240,000. The Great Central Lake daily returns have been averaging from a low of 3,000 to a high day of 16,000 salmon, while Sproat returns have lowered averaging a low on one day of 3,000 to a high day of 9,000. The Somass River conditions remain very favorable to the migration of the Sockeye as the flow is moderate and the water temperature in the river is below the 20 degree Celsius mark. While the Sport fleet in the Port Alberni Inlet will continue fishing at a possession limit of four Sockeye per day a Fin-Fishing Closure came into effect on Saturday July 24th in the tidal river area from Paper Mill Dam to the Mouth of the Somass River. The Port Alberni Inlet has been alive with migrating Somass Sockeye headed for spawning grounds and sport fishermen from all over the world taking opportunity to land the harvestable surplus. Many boat owners have come to the Port Alberni Valley to fish for the number 1 salmon-----Sockeye while many tourists and visitors from countries in Europe, Australia, New Zealand, the U.S. and many locations of Canada have hired responsible salmon fishing guides to take opportunity to sport fish for the great tasting salmon which is the current highlight at many family barbeques. The Sockeye sport fishery has been one of the best seasons in years and many individuals have taken advantage in participating in one of the best family fishing opportunities available. Children from five years old or younger and adults to age 90 or more can take part in this fishery. 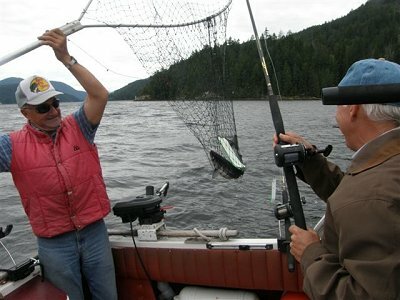 The Port Alberni Inlet invites many individuals to very pristine and quiet waters in the morning hours and allows for very easy fishing out of many boat types. The Fishing in the Inlet got under way very close to the middle of June and each day since has been more than fantastic. 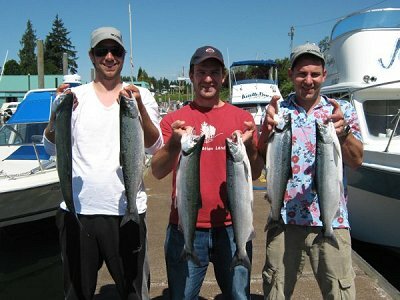 The Salmon have been in all of the available fishing areas of the Inlet with the China Creek and Franklin-Nahmint areas having the best fishing. 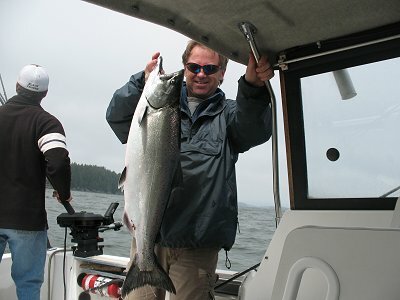 Guides from Slivers Charters Salmon Sport Fishing have entertained guests with limits of salmon on a daily basis. The sockeye are currently moving to deeper water as the air temperature increases. Lately the best fishing has been in 70 to 120 feet of water and those that use dummy flashers have perhaps had better and quicker success than those that have not. It does seem that the salmon that are biting are in deeper water. The mp hootchies in black-pink, blue-pink and bubblgum pink continue to work well with 22 to 28 inches of leader. The test fishery boat is out again this week and the run may or may not be upgraded. Sockeye fishing could very well go into the first ten days of August. The Barkley Sound fishing has continued to be on a roller coaster. There has been some good fishing in inside areas like Pill Point and Diplock over the past couple of weeks with some nice Chinook in the mid twenties and lower thirties. These fish have come into these inside areas to feed on bait in the area. Effinghan Island, Austin and Cree Island have been very good on many occasions with some good fishing lasting three or four days at a time and then cooling off and then coming on again as new schools of Chinook swim by on their migration to distant watersheds. Sport fisher persons often have to be in the location on the days that the Chinook are coming through. As of late the fish in the surf line areas have been predominately three year olds and have been coming in at 15 to 20 pounds. Slivers Charters Guides have been fishing the area and have done well on the four inch blue and green nickel coyote spoon, the army truck glow and the tiger prawn hootchie. Bait has been okay but not as prominent as it has been in past years. A purple hot spot flasher with a five to six foot leader using an army truck, chartreuse, purple haze, or UV green Rhys Davis teaser head seem to be currently working the best for those using bait. A couple of anglers during the past week have been fortunate in finding the odd halibut in the Sound. Pill Point over the weekend had one happy group land a 42 pound hali picked up on a small spoon. Guests from Abbotsford B.C. with guide John fishing off of Meares Bluff landed a 30 pound halibut using a green nickel coyote on the troll. The Coho fishing has been almost nil to date. There have been few reports of any Coho action. 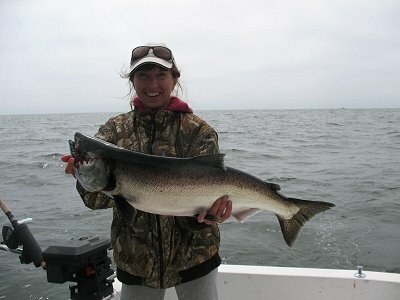 August and September should be the usual banner months in Barkley Sound for Chinook and Coho fishing. Fishing Areas out of Ucluelet continue to be very good. Like any other year not every day is banner but on most days there is enough area to move to find moving and feeding salmon. Most guides continue to do well for their guests on a daily basis for halibut and Chinook which again are predominately in the three year old category. This is not to say that there have not been any fish picked up from the mid twenties to low thirty pound category. Those traveling out to fish in Ucluelet should be prepared for some fog as the warm inland temperatures reaching 30 to 35 degrees Celsius often mean foggy cool mornings on Ucluelet waters. The Lighthouse Bank, the outside and inside south and the adipose have all had some great fishing. The Big Bank has been very good and has really been the only area that has reported some Coho although there have been reports of a few landed in inside waters. Some guides are using six and seven inch plugs and tomic spoons in shallower water because of the many pilchards swimming and schooling in the area. Often the bigger fish will come after these lures. Other fishermen are fishing deeper and are using hootchies in the form of the T-Rex and the Tiger Prawn and various white and green colors. The Ladder Ucluelet fishing derby continues through until the end of August with the final derby taking place during the second weekend of September. Each month has some great cash prizes and the entry is $10 per person. Details are available out in Ucluelet when arriving for fishing. The late spring and summer salmon fishing in this area has been very good if not phenomenal. Many guests and visitors have gone home very pleased with their catches and have exceeded many individuals expectations. We are expecting the next two months to be the same.